This gateway into the castle wasn't even the main entrance....and yet the defences built here would have been strong and difficult to circumvent. 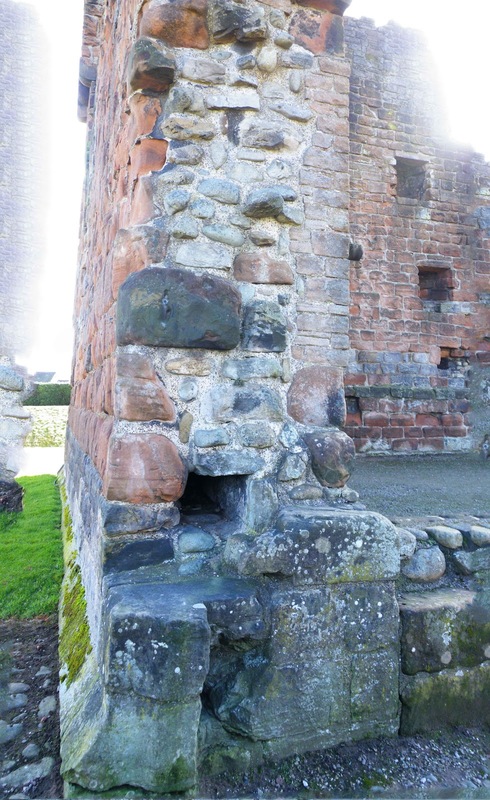 First off, the draw bar tunnel inserted into the four foot thick wall of the North East corner of the castle, would have provided the door with a strong barrier against which it could be shut. The draw bar tunnel is around 9 inches by 9 inches, providing space for a massive piece of timber. Above. The right hand side of the gateway, showing the 9 inch draw bar tunnel. The thickness of the wall, along with the depth of the tunnel and the size of the tunnel, meant that this would have been a well defended entry\exit into and from the castle. Above. Close up of the draw bar tunnel in the left hand side of the gateway. Above. All that survives of the draw bar tunnel in the right hand side of the gateway. The opposing side of the gateway has been much reduced, resulting in the draw bar tunnel on this side being exposed. In the photo above, the door jamb can also be seen. Above. The stone lintel and the portcullis groove. This photo (above) shows what I think may have been the stone lintel upon which the portcullis may have rested when it was lowered. The groove now only exists on one side of the passageway, and only to a height of around one foot. Above. Close up of the portcullis groove. Above. Modern bridge spanning the moat and the remains of the outer gatehouse tower. Finally....outside of the castle, the moat would have provided a barrier that would have proved difficult to navigate, especially if it were a wet ditch or water filled moat. Standing in the moat, a gatehouse and tower was built, providing control over traffic entering and exiting the castle. The remains of the gatehouse and tower can be seen beneath the wooden footbridge that spans the moat.